We should begin this section by reminding you that if you are staying at a resort, you probably have a very good restaurant right there. . . and if you are staying at one of the all-inclusive resorts . . . it's already paid for. For those of you who want to go out to eat somewhere. Don't worry too much about finding the restaurant. 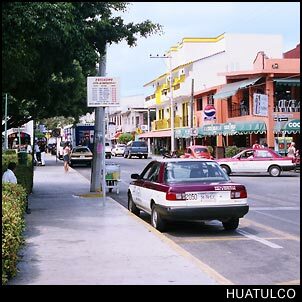 The taxi drivers know the area very well and if you are leaving your resort, you will be taking a taxi. Cactus Bar & Grill : It is what the name implies. Located on the Flamboyan side of the plaza. Cafe Dublin : Located on Calle Carrizal just over a block from the Crucecita plaza. The Cafe Dublin is a nice place to hang out, drink with the local expatriates, and make some new friends that know the area well. Unlike many other cookie cutter restaurants with booze, this place has a flavor that will grow on you. Cafe Oasis : Located on the southeast corner of the plaza. If you are interested in well prepared Mexican and International cuisine, this is the place for breakfast, lunch or dinner. El Giardino del Papa : Italian food the way it was meant to be made. Located a block west of the plaza at Flamboyan 204. Noches Oaxaquenas (Oaxacan Nights) Dinner Show : Enjoy watching Oaxacan folk dancers while you enjoy traditional Oaxacan and sea food dishes. Located at Bulevar Benito Juarez s/n (no street number) across from the Royal Maeva in Tangolunda Bay. Call 958-581-0001 for current times and prices. Sabor de Oaxaca : Located at 206 Av. Guamuchil a half block from the plaza. Oaxaca is famous for its food and you can taste why right here. A savory choice that you won't regret. Tostado's Grill : A traditional Mexican restaurant popular with the locals. In front of La Crucesita's plaza at Flamboyan 306.